Intended as Mandan's second community center, the World War Memorial Building was constructed at a cost of $125,000 ($2.2 million in 2015 dollars). At the dedication, ND Supreme Court Justice A. M. Christianson declared the building "a living memorial, a daily tribute to our men who our men who gave their lives in the great World War." The three story structure was 121 feet by 130 feet with one of the finest auditoriums in the state on the second floor. With room to seat 3,000, the 60 by 104 foot room had two balconies and included a full stage and lighting. It could was also configured as a full-size basketball court or alternately serve as a dance floor. Another spacious auditorium existed on the lower floor, plus rooms for the American Legion, showers and dressing rooms for both athletics and dramatics. A meeting room was also provided for the American Legion, plus other areas for smaller gatherings such as Girl and Boy Scouts and other similar organizations. The largest indoor swimming pool in the state, with water automatically maintained at an even temperature and automatically purified." The swimming pool, 75 feet long and 35 feet wide, was at the time also the only municipally owned indoor pool in North Dakota. It was the largest indoor pool in the state for several decades after its construction. The shallow end was 2 1/2 feet deep and included a wading pool in one corner. The pool's depth sloped to 8 feet at the opposite end. The Memorial Building boasts an Art Deco poured concrete design with brick veneer popular for large public buildings in the 1920s and 1930s. Art Deco architecture is also featured in the decorative tiles on the nearby Lewis and Clark Hotel. A block of Indian limestone weighing 1290 pounds was installed over the second story window, directly above the main door of the structure. 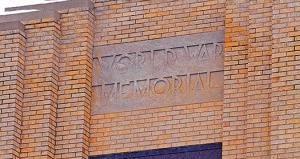 The stone block bears the reverse relief inscription "World War Memorial." Originally the stone was installed over a central southside window seven feet wide and fourteen feet high. Construction of the building began in 1932 during "The Great Depression" with Federal funds as a Works Progress Administration (WPA) project. The first floor and indoor swimming pool was opened in October 1934 amongst a four day celebration with over 4000 people from both Mandan and Bismarck participating. Events included musical entertainment by the Mandan Men’s Chorus and the high school orchestra, swimming and diving contests, lifesaving demonstrations, water stunts, a carnival and a bathing suit style show but the building was formally dedicated in September 1936. Construction would resume in January 1936 to add the second and third floors a a cost of $34,000 ($530,000 in 2010 dollars). The project would include finishing the interior of the second floor, and the addition of a third floor including the construction of a stage and dressing rooms and the basketball floor. Its auditorium with stage would host various conventions plus sporting and social events. Community kitchens and meeting rooms were included in the building, which would not be finished until 1937. 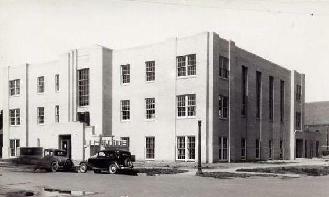 The building has served many purposes during its lifetime including hosting the Morton County Administrative offices and courthouse after the Collins Avenue Courthouse burned in a spectacular fire on May 13, 1941. It served in that capacity until 1956 when Morton County built and opened a new office building and courthouse. It would also serve as the headquarters for Company A, 131st Engineers Combat Battalion of the ND National Guard until a new Armory was later built north of the Mandan High School. The first "public" library opened in the basement, in the southeast corner of the building in March 1939. A 99 year-lease was signed by the county at no cost, but utilities to be paid by the library funds on the guarantee the facility would be open at least 2 nights a week and supply a free reading room while open. Up to that point in time, the library was not free, but operated on a subscription basis. Morton County's library remained there until 2008 when voters approved its merger with the Mandan City Library in its current location on Main Street. The building was later retrofitted with a modern air conditioning system, including the elimination of several windows on its south face and replacement of the remaining windows. The building is among four area government structures constructed to recognize military veterans of World War I. The Liberty Memorial Bridge (which was replaced in 2008), the Liberty Memorial Building (current ND State Library on the state capitol grounds) and Bismarck's World War Memorial Building also honor these servicemen and women. Today, the building houses the City of Mandan Administrative offices, including the water department, which is appropriately located over the former swimming pool. The pool was filled in the late 1960s after continued problems with the water treatment system and a new larger outdoor public pool was constructed at a site near Custer School in east central Mandan.